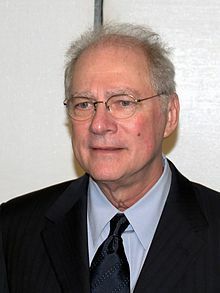 Barry Levinson (born April 6, 1942) is an American screenwriter, Academy Award winning movie director, actor, and producer of movie and television. His most famous movies are Diner, The Natural, Good Morning, Vietnam, Rain Man, Bugsy, and Wag the Dog. ↑ Erickson, Hal. "Barry Levinson". Rovi / All Movie Guide via The New York Times. Retrieved May 30, 2013. ↑ Barnes, Brooks (December 14, 2009). "Al Pacino, Barry Levinson and Buck Henry Team Up on a Roth Tale". New York Times. This page was last changed on 11 June 2018, at 08:36.